Yesterday, Israel’s Prime Minister Benjamin Netanyahu delivered his eagerly-awaited speech on Iran before the UN General Assembly in response to Iranian President Mahmoud Ahmadinejad’s tirade on the “uncivilized Zionists” a day before. 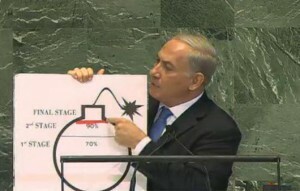 In order to illustrate the imminence of the threat Iran’s nuclear program is allegedly posing to the world, Netanyahu did not even hesitate to produce a cartoon bomb which has been ridiculed as “the Middle East equivalent of Clint Eastwood’s chair” by The Atlantic’s Jeffrey Goldberg, and as a bomb which “is not even a Clip Art bomb. This is a Wingding.”, according to The Washington Post’s Alexandra Petri. The political effects of this oversimplification – already an iconic moment of political rhetoric for sure – remain to be seen, but it seems quite a safe bet assuming that utilizing a cartoon for emphasizing something dead serious may not be the most convincing approach – and may eventually fire back on the speaker’s own credibility. Ladies and Gentlemen, what I told you now is not based on secret information. It’s not based on military intelligence. It’s based on public reports by the International Atomic Energy Agency. Anybody can read them. They’re online. So if these are the facts, and they are, where should the red line be drawn? The red line should be drawn right here: before Iran completes the second stage of nuclear enrichment necessary to make a bomb. Each day, that point is getting closer. That’s why I speak today with such a sense of urgency. And that’s why everyone should have a sense of urgency. Some who claim that even if Iran completes the enrichment process, even if it crosses that red line that I just drew, our intelligence agencies will know when and where Iran will make the fuse, assemble the bomb, and prepare the warhead. Look, no one appreciats our intelligence agencies more than the Prime Minister of Israel. All these leading intelligence agencies are superb, including ours. They’ve foiled many attacks. They’ve saved many lives. But they are not foolproof. For over two years, our intelligence agencies didn’t know that Iran was building a huge nuclear enrichment plant under a mountain. Of course, this is a half-truth, suggesting that Israel’s assessments are solely relying on open source information. There are good reasons to believe (and hope) they are not. If the aforementioned IAEA reports really were Israel’s ‘best truth’, then the Mossad would certainly not deserve to be called “superb”. In other words: referring to open source material makes Netanyahu’s specific claim (Iran’s capabilities) more perspicuous, and, thus, makes his overall argument (Iran’s intentions) more credible politically. Or, in even other words: it is a trick of persuasion known as ‘petitio principii’ which Schopenhauer elaborates as a “plan […] to beg the question in disguise by postulating what has to be proved […] under another name”, but admittedly it’s not a bad one for justifying something as controversial as an evaluation of Iran’s nuclear program before the eyes of the public. My colleagues, every statement I make today is backed up by sources, solid sources. These are not assertions. What we’re giving you are facts and conclusions based on solid intelligence. I will cite some examples, and these are from human sources. […] Ladies and gentlemen, these are not assertions. These are facts, corroborated by many sources, some of them sources of the intelligence services of other countries. […] One of the most worrisome things that emerges from the thick intelligence file we have on Iraq’s biological weapons is the existence of mobile production facilities used to make biological agents. Netanyahu acknowledges his intelligence agencies’ ‘unknowns’. This does not make it easier for Israel to come up with clear-cut decisions as capabilities do not equal intentions, but it is proof that it has become harder to resort to force in preventive or preemptive self-defense on grounds of secret intelligence alone. This was written by Florian Schaurer. Posted on Friday, September 28, 2012, at 14:26. Filed under General. Bookmark the permalink. Follow comments here with the RSS feed. Trackbacks are closed, but you can post a comment.